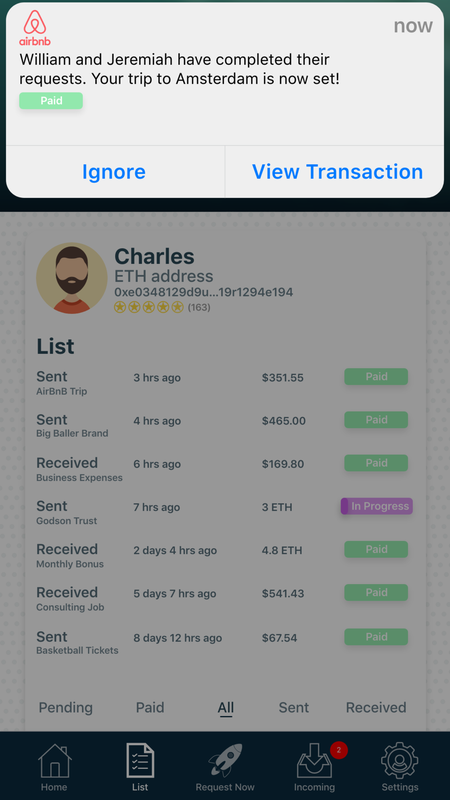 I made a iOS prototype for Request Network, an ongoing blockchain project that is going to change the game for many aspects of financial services. You can view my original Medium post here. Huge thank you to the Request Network team for shouting me out in their most recent Project Update. My Medium post and prototype received a lot of positive feedback from the Crypto community as a whole through Reddit, here, and here. It was the top post on /r/RequestNetwork and /r/CryptoCurrency on December 20th, 2017, and was reposted on other subreddits by some awesome community members. My Medium post received over 8k views on December 20th and was picked up by the publication freeCodeCamp which is the 4th highest subscribed publication on the platform with over 363k followers. The Request Team was kind enough to offer me an undisclosed bounty for my work as well, which I greatly appreciate! The goal of the prototype is to expand the overall reach of Request Network's project and display to current and future community members various potential use cases that could be implemented in the iOS application upon release. Problem: With a white paper product, it’s sometimes difficult to explain the concept visually, with a promised iOS app by end of 2018, I wanted to build a clickable prototype for the company and community following the project to be able to better understand multiple use cases. The company is in very early stages currently and focusing on development and technicals, so delivering polished UX was a huge priority to help potential future users go from concept to actual journey. Solution: Create an iOS prototype for Request inspired from the few mock up images they have released to the public. Demonstrate various use cases for the average consumer or merchant who will be using this platform in the future. Showcase how smart contract implementation can reduce bottlenecks. With coded parameters on invoices, business expenses, and more users from many demographics will benefit from using Request. Visually display the projects overall concept through a user friendly iOS prototype that simplifies the technical details. Create hype for the product increasing market reach through easy share-ability of the prototype and funnel word of mouth spreading through posting in existing community channels. Market research: Throughout the process of building this prototype, I performed market research on different purchasing methods for e-commerce sites and the pros and cons for both merchants and consumers of using Credit Card payments as well as PayPal, user experience of other polished and user friendly payment apps like Venmo, and conceptualized across multiple industries how this technology could be implemented on a daily basis for the average person. With Request, employees at any company could easily input all of their business expenses in whatever currency they were paid for in and get refunded by their employers with the click of a button. Depending on where the expenses took place, the Request Network can automatically input the correct tax’s to the payments based on specific countries/states applicable laws. Right now when dealing with business expenses, it may take till the end of the month to get refunded, but with Request you can get refunded for your business expenses whenever your higher up receives the request. The expenses can then easily be added to your companies book by adding visibility to whoever is in charge of accounting at your company so they can track all of the incoming business expenses in real time. 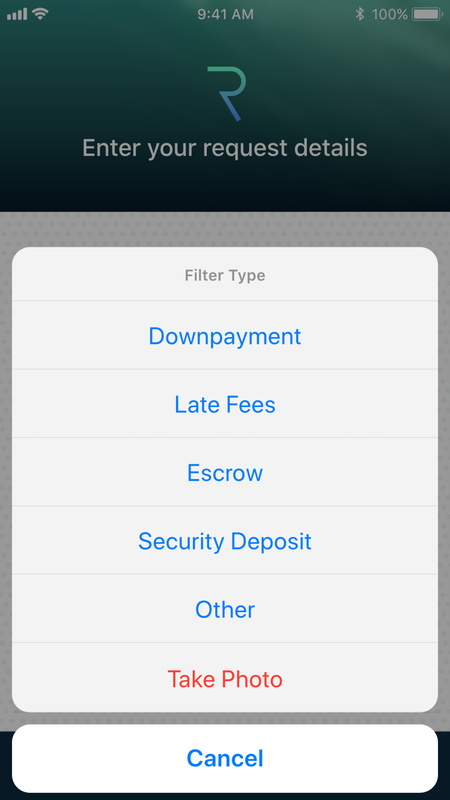 For the prototype I added a feature I think would be really beneficial to employees inputting their business expenses, which is the ability to take pictures of your receipts sort of like how The Bank of America app allows you to scan checks right into your account. I don’t know if this is something that the Request team has thought of, but I think it would be super efficient to this aspect of the platform. Above are a few mockups of this section. E-Commerce could benefit by using Request for a number of reasons. From a buyers perspective, the transaction fees when buying things using Request are extremely minuscule in comparison to using PayPal and Visa for example. Not only do you not have to worry about crazy fees for purchases, but the Request Network also enables you to have a peace of mind when purchasing from merchants due to their reputation system. 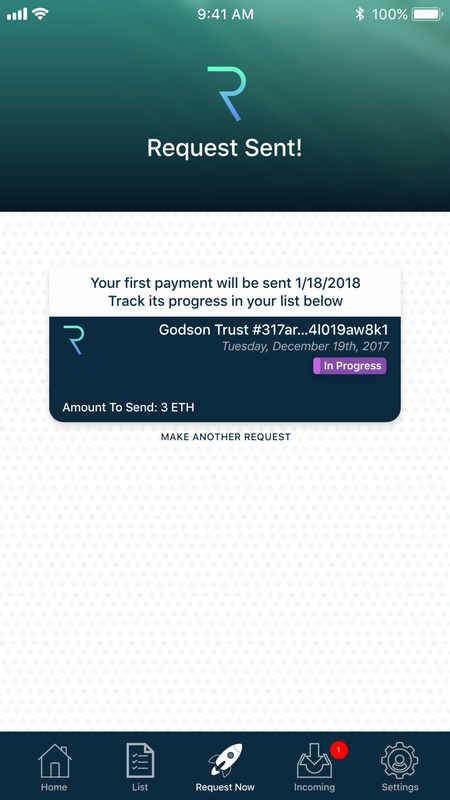 On Request, users will have a reputation score based on how quickly they complete their transactions with other parties. 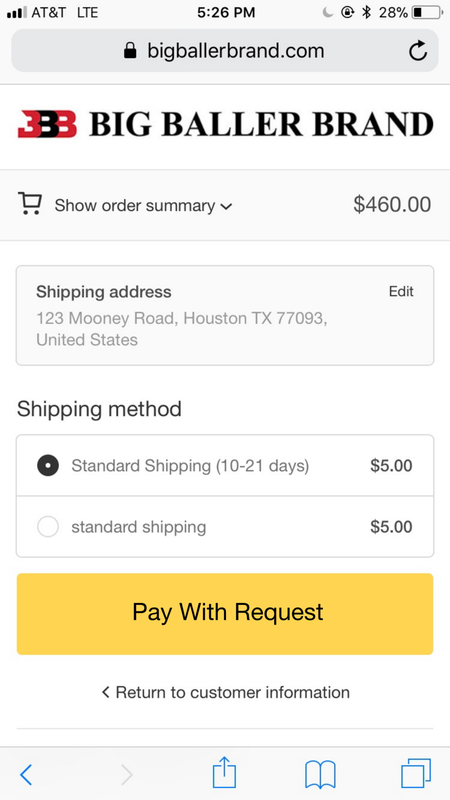 From the standpoint of a seller, I think that including things such as promised shipment time would be another great addition to the reputation system to ensure that merchants are keeping their word for how long they are telling consumers their orders will take to reach them. With Request you can pay in literally any currency. Various countries native currencies or a plethora of crypto currencies. Even if a merchant isn’t accepting a certain type of currency, Request is able to serve as an intermediary and exchange any currency you pay with for what the merchant is accepting thanks to partnerships they have with others in the Blockchain space. This costs the buyer and seller literally nothing! Another huge benefit that consumers have when paying with Request for E-Commerce is that they won’t have to input any personal credit card information, so that gives consumers another sense of peace of mind for security purposes. For this section of the prototype, I acted as a consumer making a purchase with The Triple B’s, Big Baller Brand. What better way for a growing business to create more demand then to be able to accept any type of currency from anywhere in the world. E-Commerce sites could potentially with Request give consumers the ability to make one full payment for purchases or multiple installments of automatic payments over a period of time based on any type of purchasing parameters they choose to set when they start incorporating Request. Congratulations, your best friend from college is having a baby boy! The parents named you the kids God Father, wow what an honor you must be awesome. Being the amazing person you are, you have decided to use Request to start a college fund for the soon to be born baby. With Request you can make any type of escrow payment and set endless versatile parameters for any type of situation. For this example, I have said that you’re going to give the kid 3 ETH every year from the day he’s born until he turns 18. The payment structure is set up annually so every year on his birthday for those years 3 more ETH will be sent to his account. The funds will be locked up until his 18th birthday and monitored by both parents by setting visibility, so hopefully he doesn’t go wild and just spend it all immediately when he turns 18. (Fingers crossed). You also decided since you guys don’t live in the same city that you’d like to set up a gift every year for his birthday starting on the 10th payment. I’ve chosen to allow 0.25 ETH be immediately available for the kid on each annual payment starting on his 10th birthday when he’ll probably have some things he’d like to purchase. The escrow potential is limitless with Request. With Request you can make any type of escrow payment and set endless versatile parameters for any type of situation. 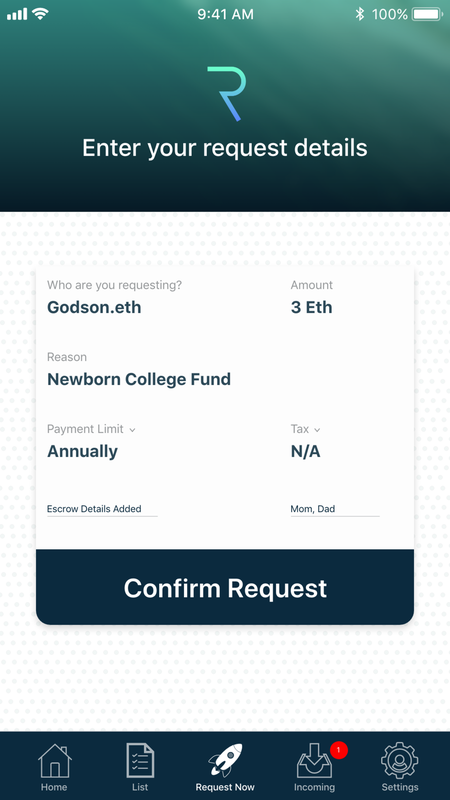 This use case has a new God Father sending automatic payments every year on his God Son's birthday through a smart contract until he turns 18. The funds will be locked up in escrow until the last payment and his parents can be set as monitors of the funds as well. This one is pretty self explanatory. For this scenario the user has planned a trip to Amsterdam with friends. 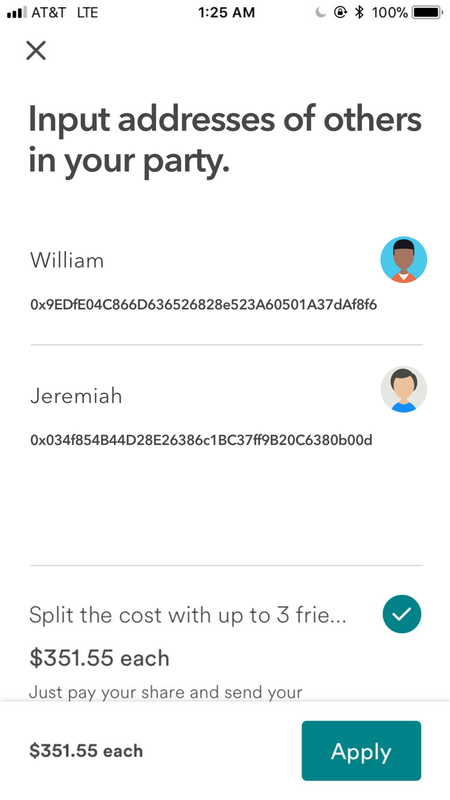 When paying with Request in this situation, the user can seamlessly split the cost of the apartment between the parties and requests will be automatically sent to his friends addresses for them to pay so that the trip can be confirmed by the home owner. Also, any types of currency could be accepted so while it says USD below, any of the users could pay in the form of currency they choose to and Request will automatically exchange it for what the home owner is accepting. The simplicity and ease of use is astounding. Request would really come in handy because when the home owner returns after you guys finish your trip and find that you left the place nice and tidy, they can simply send your security deposit back to you at the touch of a button. 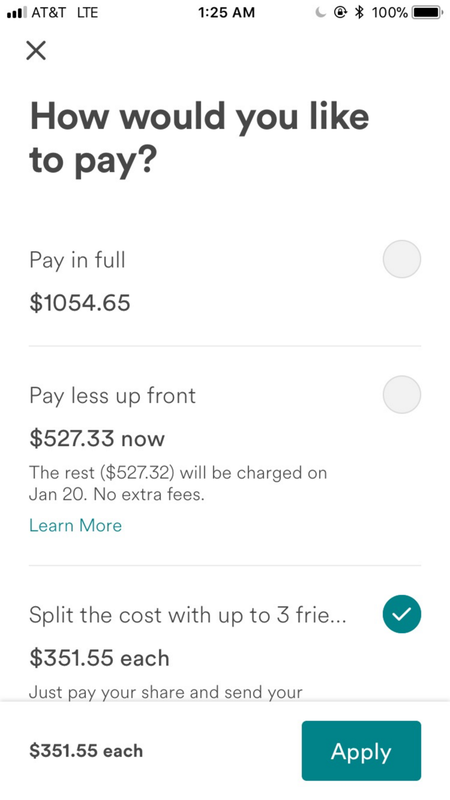 Again, minuscule transaction fees using Request in comparison to other payments options that are available today. Home page on the left showing users balance, the ability to view the specific tokens they currently hold which adds up to the real-time value of their native fiat currency they can select from in settings as well as their current pending requests below. And look at that, your friends William and Jeremiah paid their requests to AirBnB almost instantly after you sent it out to them. Enjoy your trip!